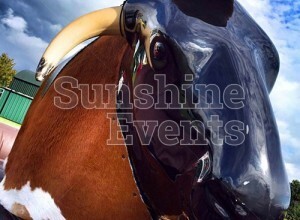 Our collection of Bucking Broncos also includes Rodeo Sheep and Surf Simulators available to hire for your event. How long can you last? The Rodeo Ride is a staple at all events, from Birthday Parties and Weddings to Corporate Events including Team Building, and we’ve got a variety of rides available. 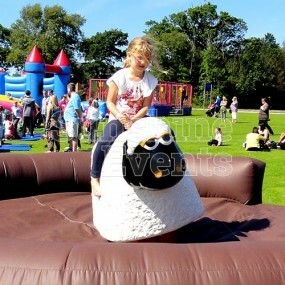 The classic Rodeo Bull is great fun and perfect for Western themed events too, where the Bucking Bronco is sure to thrill and entertain - but switch it up for a Rodeo Sheep and you’ve got a ride that spectators will enjoy just as much as the rider. 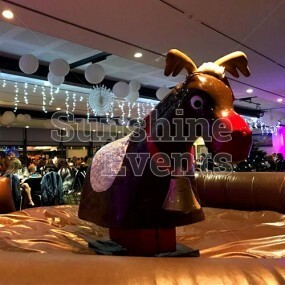 For Christmas events, we have the Rodeo Reindeer! Modelled on Rudolph himself, the Rodeo Reindeer features a blinking red nose and soft antlers, but all the fun and excitement of the bull and sheep options. And then there’s our very special Rodeo Donkey - a quirky, bucking, kicking mule! For those who are steadier on their feet, we have the Surfboard or Snowboard Simulators. 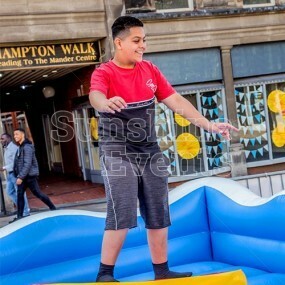 Offering the same type of versatile movement, but riders stand on the board instead of sit and they’re perfect for themed events. 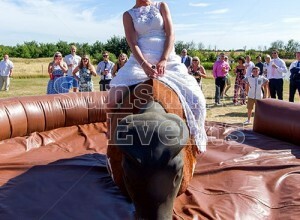 There’s something for every event - we’ve had brides jump onto the bull and last longer than anyone else at their weddings; corporate events where everyone goads the boss into having a go and then laughs when he falls off; and team building events as part of a larger game. Points available for staying on the longest! A bottle of bubbly to award to the overall winner! 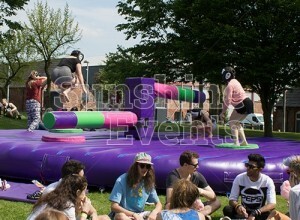 So grab hold and let the Rodeo twist and turn you until you inevitably take the plunge on to the inflatable bed. 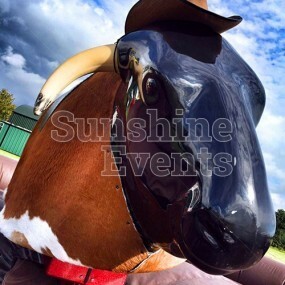 Sunshine Events have over 10 years’ experience in providing Rodeo Rides for events and with £10 million in Public Liability you can rest assured that you’re in safe hands. And of course, there’s risk assessments and Method Statements available from our website as Health and Safety are of paramount importance on a ride such as this. We own and maintain all the equipment ourselves, so you can be sure to receive a quality piece of equipment, that looks exactly as it does on our website. 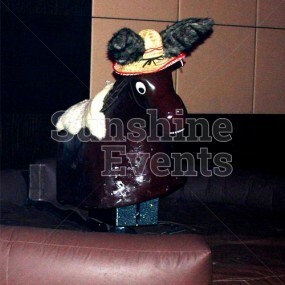 Head to our CustomerSure reviews to see what other people have said about their hires From Sunshine Events. All the reviews are from real customers and completely unedited from their replies. 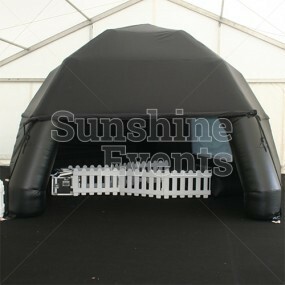 You can trust Sunshine Events to provide exactly what what we say we will. You can head to the Rodeo Rides Gallery to see all our Rodeo rides in action at our recent events. We’re constantly updating our equipment and pictures, so be sure to check back regularly!